What hurts more than rejection? Being told over and over again that you’re not right or not good enough for whatever reason is painful—and at some point, you have to begin wondering where the problem lies. One angle that needs to be explored, despite the discomfort, is whether you’re the one doing something wrong. The good news is warning signs are pretty clear. Here are three red flags—and more importantly, what to do about them. This can be an incredibly demoralizing situation to be in. It’s also a huge red flag that I doubt you’ll miss. You’re clearly doing something right to get all the way to the final round interview. So, what’s preventing you from sealing the deal? Frequently, when you get this far along in the process, you’re only competing with one or two other people. Plus, it’s likely already been established that you have the right experience or qualifications for the role. The last thing, then, is how well you understand the position, the company, and the team. If you’re not getting past the final round, you’re probably not getting across what you know about at least one of these. This means you need to dial up your company research. Do your homework on the company by reading everything you can get your hands on about it, ask thoughtful questions about the role throughout the process, and make an effort to really connect with the team and show them just how well you’ll fit in. 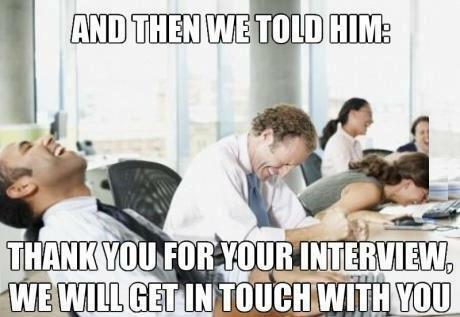 Finally, don’t forget that all this only matters if you actually show off what you know during the interview. You definitely have a polished resume, because you’re landing plenty of first round interviews and phone screens, but strangely, you’re not progressing beyond that. What gives? Your skills and experiences are obviously eye-catching and relevant enough to get someone’s attention, so it’s not that you don’t have anything to talk about. Instead, you’re probably not conveying your stories well. Sometimes it’s all about the delivery. In the end, the only way to address this is through practice. You have the raw goods. Now, polish them up by going back to the basics and answering practice interview questions aloud with a friend. Assuming you’re applying for jobs you are qualified for, not getting any callbacks after numerous applications is disheartening. Something is up, but with so little information to work off of, it’s hard to say what. Of course, your first step is to check your materials. Tailor your resume and cover letter to the position, then put your editor cap on and follow these tips to make sure what you’re sharing will impress your audience. If you’re doing that already and the problem doesn’t lie with your documents, you’re probably not networking enough. Networking turns people off for lots of different reasons. It’s uncomfortable. It’s nerve-racking. It’s not meritocratic. It also works. And, right now, that’s what you need to focus on. Conduct informational interviews with people at your target companies, and put your immediate network to work by letting them know what you’re looking for. It takes perseverance to get through a long job search without going out of your mind. The key is to constantly be focusing on and reevaluating how you can better tackle the problem in front of you—even if the problem is, well, you. This entry was posted on Wednesday, June 24th, 2015 at 8:22 pm	and is filed under Interview. You can follow any responses to this entry through the RSS 2.0 feed. You can leave a response, or trackback from your own site.